England boss Roy Hodgson has no plans to quit before the 2018 World Cup as the Football Association backed him to stay on if Euro 2016 goes well. Hodgson will have worked in coaching for 40 years as of 1 January. "If you ask me at this moment in time can you see yourself working after next summer, I'd have to say yes, absolutely," the 68-year-old said. FA chief executive Martin Glenn said: "If we do well in the Euros, then he is our man for 2018." Hodgson was hired in 2012 and his deal runs until the finals of the European Championship in France. He added: "It will be my 41st year next year, which I'm very proud of. I don't envisage anything at the moment - anything other than the tournament - but it depends how I feel." Glenn, who was speaking immediately before the Euro 2016 draw that saw England placed in a group with Wales, Russia and Slovakia, added: "If we see progress, this will make us feel that Roy is the best person to take this young team forward and really fire at the next two tournaments." FA chairman Greg Dyke also backed Hodgson. He told BBC Radio 5 live's Sportsweek: "I think if we don't get out of the group stage Hodgson wouldn't want to continue," but added that he believed England had a "good chance" of reaching the semi-finals in France. 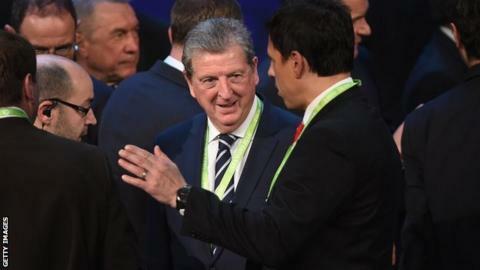 In September, Glenn said Hodgson would not be given a new deal until after the tournament to avoid the "unsavoury position" that emerged under Fabio Capello. Capello signed a new contract prior to the 2010 World Cup, where England were thrashed by Germany in the second round. Can England succeed in France? Hodgson warned that his side's injury problems could mean a much-changed squad next summer from the one that earned a 100% qualifying record. "I don't know for the life of me what that squad will look like when I name it in May because I don't know what players will be available," he added. "In the build-up [to the friendly games against the Germans and Dutch] in March I will become frustrated if I get a 23 in my mind at the end of February, and am watching games and seeing people carried off injured. "It will be a damn sight more frustrating when I've got the 23 players, or 25, I'm really counting on to go to France, and then I'm seeing them disappear through injury or I'm learning that players I'm hoping will recover from injury might not do so. "I had been counting on Welbeck, Wilshere, Delph, Sturridge, Shaw until he broke his ankle. I'd been counting on them since June and yet still haven't seen hide or hair of them since June. You could add Walcott and Oxlade-Chamberlain to that as well." Euro 2016 will be Hodgson's third tournament in charge of the Three Lions. The former West Brom boss took over less than two months before Euro 2012, replacing Capello as manager, and led the country to the quarter-finals, where they lost to Italy on penalties. England qualified for the 2014 World Cup but went out in the group stages, picking up only one point from their three games - against already qualified Costa Rica. But they have won every competitive game since then as Hodgson led England to Euro 2016 in convincing fashion, the only country to win all 10 qualifiers. "I'm a big believer that people learn," Glenn said. "Roy has had two tournaments, he was very early for the first Euros and then he has had the World Cup. He has learned a lot and he has great international experience. "He has had to rebuild a team. He had an ageing team for the last World Cup. He has built something different and has got some different things in his set-up now. "I think we have to show real signs of progress - an England team performing better than in the past two tournaments and playing better. We have said we want to be in a position to win the World Cup in 2022. "There are three tournaments before then and I want to see progress in each one. Each one should be a stepping stone with tangible signs of improvement in results and the way we play." Who might replace Hodgson eventually? Glenn hinted that England assistant Gary Neville could be a contender to replace Hodgson. The former Manchester United defender recently took over on a short-term contract at Valencia, while continuing his England role on the England coaching staff. "It doesn't harm him at all because it's real experience," Glenn said.